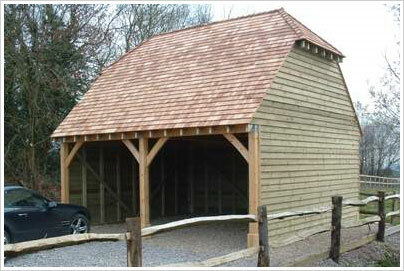 Here is our range of Oak frame ‘style’ Garages. Our luxury garage kits are available with 3 different roofing styles: Barn-end, Hipped and Gabled-end. Each model has the option for additional bays. Don't forget each standard design can be customised to suit your requirements. Please contact us by leaving your details here or call 01825 722 600 for more details. Remember we can't be beaten on price for our timber frame building system as we manufacture the timber kits! 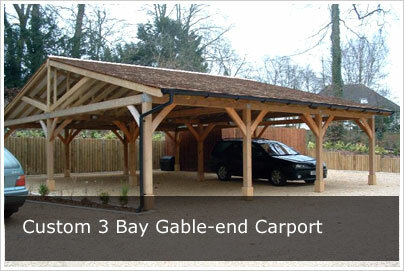 Please refer to the floor plan and elevations below for dimensions of our oak 'style' garages. What roofing material can the timber frame system take? We get asked frequently which roofing materials are suitable for use with our carports, as most clients like to match roofing with their house or surrounding buildings. The answer is that the timber frame system has been engineered to except nearly all types including heavy clay and pan tiles. We currently offer cedar shingles (see image to right). However, If you have special requirements, please let us know.